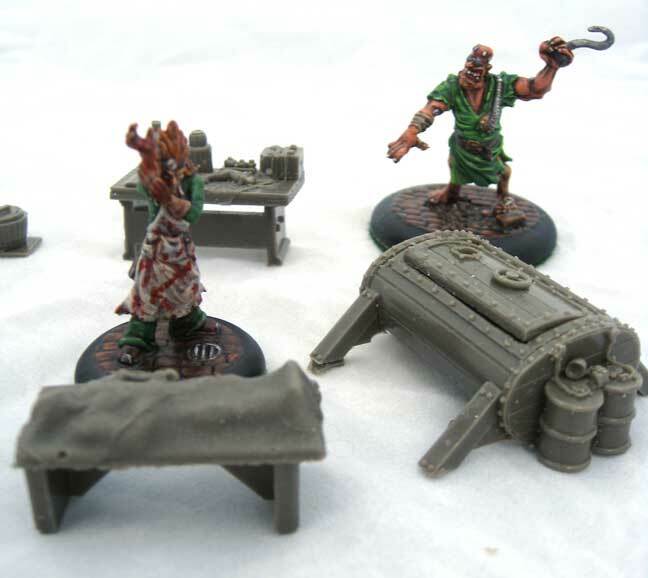 Frontline makes some nice resin terrain that fits the scale for game of Malifaux. I picked up the Dr. Jekyll's Lab and Frankenstein's lab. Both are pretty nice pieces that consist of tables, bookshelves, and a tank. The price isn't too bad and they are available in the US through the link at the beginning of this post. They look like they'll fit well in the fortress laboratory I'm considering building as my next project. Speaking of large projects, I've been building the Qi & Gong for my Victorian City terrain set. I'll be posting photos and tips for building large scale buildings in a future post.